Axia is a value driven professional organization that primarily focuses on property development and management. 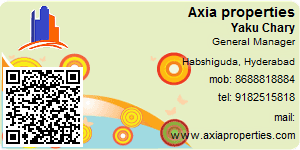 Axia admires and respects the power of people, places and penny in every action and transaction. We believe that the world is being orchestrated beautifully by awesome people and their life energy. We at Axia are committed to contribute to this amazing world by adding value through creation of innovative and sustainable projects; enriching relationships and uplifting universal harmony. The word Axia means value and strength, living that very meaning is worth our breath. Axia respects and practices this core meaning in fullest sense. We initiate any project only when we can demonstrate our spirit through the value for investment, respect for people and win-win strategy for growth. Address: Keesara, Habshiguda, Hyderabad, Telangana, India. This Broker Profile page for "Axia properties India Pvt ltd" has been created by PropertyWala.com. "Axia properties India Pvt ltd" is not endorsed by or affiliated with PropertyWala.com. For questions regarding Broker Profiles on PropertyWala.com please contact us.